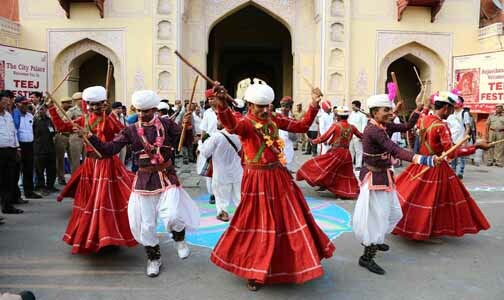 Jaipur : The traditional Teej procession was taken out with all its regal pomp and pageantry today in Jaipur. It started from the Tripoliya Gate (City Palace), meandering its way through Tripolia Bazar and Chhoti Chaupar, Gangauri Bazaar to wind up at the Ponderik Park near Chaugan Stadium. The procession was organized jointly by the Department of Tourism, Government of Rajasthan; the City Palace, the District Administration, Jaipur and Jaipur Municipal Corporation. The procession will also be taken out tomorrow at 6 pm. Organized with great verve and vigour the procession today was witnessed by the tourists, the travel fraternity and the local populace. There were camels, horses and cultural performances like Kachchi Ghodi, Gair, Kalbaliya and chakri dances. 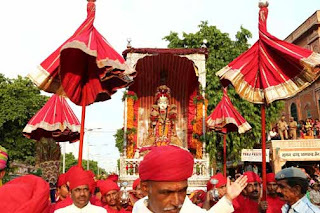 The procession included: the cannon carriage, bullock carts, horse baggi and decorated rath. A number of bands also accompanied the procession. The sawari of the Goddess Teej was at the fag end followed by chobdar and women with ‘kalash’ in traditional dresses. The Department had also made arrangements for the tourists to photograph the procession from the terrace of the Hind Hotel opposite Tripolia gate. There was also the facility for applying of henna on the hands for the lady tourists at the terrace.